How was it that Christian theology emerged so rapidly and with such a high degree of definition? What patterns of interpretation, already known in late second Temple Palestine, crystallized around the person of Jesus Christ and his work? Margaret Barker believes that Christian theology matured so quickly because it was a return to a far older faith. Those who preserved the ancient tradition rejected the second temple and longed for the restoration of the original true temple and the faith of Abraham and Melchizedek, the first priest king. In this fascinating discussion, the author refutes the scholarly assumption that crucial Christian concepts such as the Trinity, the earth as a reflection of heaven, and the cosmic structure of the atonement, are informed by Greek culture. Rather, she argues, they are drawn from the eclipsed faith of the first temple. 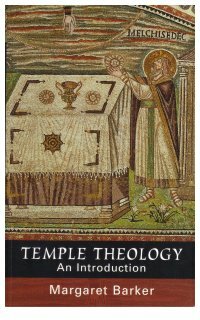 "Margaret Barker’s interpretation of Temple Theology should not be ignored by anyone interested in Judaism and the origins of Christian faith."